Attract pollinators like bees with these easy wildflower starters. For the tiny pollinators essential to our food production, life isn't always a bed of roses. Make their jobs a little easier with these cute and convenient wildflower gardens. 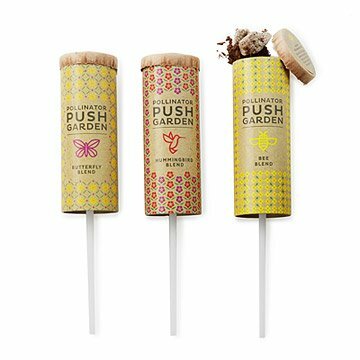 Each is designed with a custom collection of seeds to attract specific pollen loversbees, butterflies, and hummingbirds. They include nutrient-rich material and instructions for planting a one square-foot garden patch in a few simple steps. Designed by Sarah Burrows and Nick Behr; made in Illinois. 1. Pick a sunny spot. 2. Break up a 1 sq. ft patch of soil with a garden trowel or small shovel. 3. Evenly spread Push Garden micro-nutrient rich grow medium over patch and blend in soil. 4. Scatter seeds across area and gently tap down. 5. Fill empty push garden with water and pour over area until damp. Repeat if needed. Includes wildflower seed blends to attract butterflies, hummingbirds, and bees. I love this item. Pretty and practical. Best gift for the person who has everything. She is moving from a house to an apartment (surprise move). She could put in pots or use for a design at her job. She's a bright woman and she'll figure it out. We love container gardening. This gives us a fresh and new approach to explore. Will be planted at appropriate time. Eagerly awaiting results. This is a gift so she has not used it yet. Bought this for my step daughter as a Christmas stocking stuffer. She loves growing and caring for flowering plants and succulents. The gift recipient used it in garden/outdoors.. Will purchase again.